The initial proposed decision denied MTA's application at Dorsey and at Foshay, and required MTA to build a pedestrian bridge at Foshay that would have cost $5-8 million to construct. That proposed decision was written by Administrative Law Judge Kenneth Koss and the assigned CPUC Commisioner Timothy Simon, who both have been monitoring this case for the past 2 ½ years. It was they who attended the public hearings at Dorsey in November 2007 and at Foshay in July of 2008. It was they who presided over the week long evidentiary hearing that involved the testimony and cross-examination of over a dozen expert witnesses. McCubbin and the Expo's high-paid attorney initiated nearly two-dozen backroom/off-the-record meetings with the CPUC Commissioners and staff, and convinced Commissioner Rachel Chong, to author an Alternative Decision to Simon's, that would remove the pedestrian bridge at Foshay that Simon originally found necessary at the end of the trial. Then Westside politician Zev Yaroslavsky, who doesn't represent any community within miles of Dorsey or Foshay pressured the Commission (pdf) to overturn Simon's previously required pedestrian bridge at Foshay and adopt the Chong Alternative. The L.A. Country Metropolitan Transportation Authority and its Exposition Light Rail Construction Authority with their army of lawyers, consultants, lobbyists and PR agencies, which are all paid from our tax money, are vigorously pushing and asking for CPUC approval of their at-grade crossings near the two schools. However, the local community organizations and the Los Angeles Unified School District are opposing such at-grade design of intersections. The public's distrust of MTA is rooted in its dismal safety record. Ninety people have died on the MTA's 22-mile L.A.-Long Beach Blue Line, which has had more than 821 recorded incidents since its inception in July 1990 to July 2008. These numbers, which are significantly higher than national average rates of accidents and fatalities along the MTA rail network, attest to the dire state of rail safety in LA, which is primarily caused by MTA's outdated and messy safety-related policies, procedures and practices. If the CPUC has not learned its lessons about the human factors-related root-causes of past rail accidents, and does not fully scrutinize MTA's proposed crossings' risk and hazard analyses, then CPUC's "easy" approval will be tantamount to granting MTA and its Expo Line Construction Authority a license to kill and maim school children and adults on the Expo Line for the next decades to come, as approximately 72 million Dorsey students who will use the Farmdale Avenue crossing during the expect life of operation of this line. The CPUC's approval would provide MTA with the alibi - the "design immunity" in legalese - for so doing. The Metrolink crash in Chatsworth on Sept. 12, which killed 25 and injured more than 135 innocent people, highlighted the need for much more rigorous government scrutiny of rail safety in the country and especially in Southern California. It is against this sober backdrop that we -- the badly hit Southlanders -- are pleading and looking up to the north for a protector from future rail carnages. There are rare occasions that a San Francisco-based state agency's decision can determine the risk to life and safety of millions school children in Los Angeles for the next 75 to 100 years. However, this CPUC's decision will be a precedent-setting case and there certainly will be future similar cases elsewhere in California, and as such, many more lives will be at risk. In fact, the term "light rail" is a bit of a misnomer. Each of the three-coupled 225-ton train cars will operate at speeds of up to 55 miles per hour. Expo Line trains will run every 2 to 2.5 minutes, 22 hours a day, in opposite directions on parallel sets of dual tracks and will cross Farmdale Avenue at street level (at-grade), within 10 feet of Dorsey High School, which has 2,100 students, and will cross Western Avenue and Harvard Blvd., also at street level, within 50 feet of the Foshay Learning Center, which is a K-12 Multi-Track School with 3,400 students. Moreover, the automatic "design immunity" entitlement of MTA has also been responsible for the status quo, as well as stifling any motivation and imputes within this agency for any fundamental change and systematic safety improvement. Neither numerous deaths and the resulting protracted litigations, nor trail or appeal court's affirmative rulings against MTA in favor of the rail accident's victim (plaintiff), have been able to make a dent in the MTA's dismal safety practices. This time around, the CPUC approval of MTA's requests for the Expo Line would do the same. It will not only continue to shield MTA's unsafe crossings and operation against any future lawsuits stemming from accidents and resultant injuries and deaths caused by design-induced errors of pedestrians and drivers on the Expo Line, but also will further hardened MTA's entrenched archaic safety culture. It is truly perplexing that the Exposition Light Rail Construction Authority, even in this dismal state economy, is still continuing to squander millions of dollars of precious taxpayers' money by lavishly paying for thousands of pages of legal briefs, stubbornly fighting neighborhood community organizations, and recklessly disparaging scientific facts which justifiably question and refute its proposed designs. This is the money that should have been spent on making the Expo Line safer and our hope is that the CPUC puts an end to this vicious cycle. The CPUC of today has much greater competent technical resources and it can (and should) learn from other agencies such as the National Transportation Safety Board and do much better job than what it did some 30 years ago and consequently we are stuck with the Blue Line's unsafe intersections. We can only hope that what the American philosopher William James said, "great emergencies and crises show us how much greater our vital resources are than we had supposed," also applies to California and its PUC. Najmedin Meshkati is a professor at the Sonny Astani Department of Civil/Environmental and a professor at the Daniel J. Epstein Department of Industrial & Systems Engineering (ISE) at the Viterbi School of Engineering, University of Southern California. He teaches and conducts research on the safety of technological systems and created USC's Transportation Safety Program in 1992. Robert "BJ" Takushi, a recent graduate of the Epstein ISE Department, received a grant from the Rose Hill Foundation to study the Expo Light Rail safety. In October, the Expo Line Construction Authority, which has been placing expensive full-page ads in black newspapers, held a "Q & A" with the editors of the LA Sentinel. As will be explained in a follow-up post, this is a component of the spin and smear campaign currently being waged by Expo through their $167,453 "public relations" contract with the firm Dakota Communications, a specialist in Astroturf and other dirty public relations tactics. UPDATE: Click here to download this is pdf format. The following is a comprehensive response to the spin, red herrings, and half-truths delivered by MTA/Expo. The Sentinel: The Los Angeles Sentinel recently held an editorial board meeting to address many residents’ concerns over the ongoing Expo-Line. Participating at the meeting on behalf of the Expo Line were Exposition Construction Authority CEO Samantha Bricker, Council members Bernard Parks (D-10) and Jan Perry (D-9) and representing the community were Cherisse Bremond-Weaver, president of the Brotherhood Crusade and activist Lillian Mobley. 1) Samantha Bricker is the C.O.O. 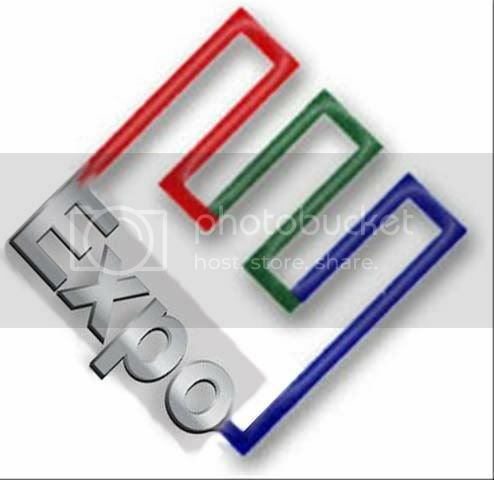 of Expo, not the C.E.O. ; Rick Thorpe is the C.E.O. Ms. Bricker does not live in the South LA community. Indeed none of the Expo project managers or executives live in the South LA community. 2) The work Mrs. Bremond-Weaver is doing at Brotherhood Crusade is phenomenal, and Ms. Mobley is a Watts icon who we all owe a debt of gratitude. But don't you think a much fairer Q & A would have included some of the leaders of the community groups who have intimate knowledge of this project, and are accustomed to responding to the spin from the Expo Authority and our politicians? If MTA/Expo is sending their lead spokesmen to answer community questions, why wouldn't a lead spokesman of Fix Expo be the person asking the questions? Our elected officials are making decisions downtown that benefit their personal political ambitions at the expense of South LA, and they refuse to come to the community meetings to be held accountable and face the hard questions. MTA/Expo Spin: This project has been on the drawing board for many years. Metro acquired the Exposition railroad right-of-way from Southern Pacific railroad in 1991. THE FACTS: From the beginning through the end of the environmental review process, the community has had the same concerns with the design of the Expo Line that every informed community has with light rail lines: safety, traffic impacts, noise and vibration, and community division. MTA’s own Expo Line environmental review documents show comments about safety and requests for grade separation were recorded as far back as 1993. The people spoke. The politicians didn't listen. The politicians didn't lead. The bigger point however, is that there is a vast discrepancy in the way the politicians and MTA/Expo responded to the concerns of Culver City vs. the way they responded to the concerns of South LA. The major concerns were the same; they were equally legitimate. But the manner of response by MTA/Expo and the resulting community impacts for the next 100 years are as different as night and day. MTA/Expo Spin: The line will include the same safety features as the Pasadena Gold Line, which is one of the safest light rail lines in the country. 1) MTA/Expo is not building a Pasadena Gold Line; they’re building a Blue Line, which with more than 821 accidents and 91 deaths is the deadliest most accident-prone light rail line in the country. MTA/Expo knows it and they refuse to admit it. As has been proven by international experts in transportation system safety, the Expo Line and the Pasadena Gold Line have more differences than commonalities, and it is the differences on the Expo Line that pose the hazardous risks and community impacts to South LA. MTA/Expo's claim that the lines are similar is inaccurate and deceptive. Essentially, MTA/Expo is claiming that if a little Ford Pinto has seat belts and a Hummer has seat belts, the Pinto is just as safe as the Hummer. 2) MTA/Expo's definition of “safe” is tragically different from the rational definition of safe, as evident by their operation of the deadliest light rail system in America, and Metrolink’s operation of one of the deadliest commuter rail networks in America. MTA/Expo Spin: When the light rail is “street running” the line travels parallel to the street and the train operates with the traffic signals. [….] No gates are necessary in these street running sections since the train will be moving with parallel traffic. The street running section is roughly from the Pico Station downtown to Gramercy. THE FACTS: According to MTA's June 2008 Summary of Blue Line accidents, 92% of the 647 recorded vehicular accidents on the Blue Line, the deadliest most accident-prone light rail line in the country, have occurred in the street-running section, and 76% of the 821 total accidents recorded on the Blue Line have occurred in the street-running sections. Again, 76% of the total accidents and 92% of all vehicular accidents occur in the street-running section, despite the fact the section only accounts for 25% of the line’s length. In fact, a Gold Line train traveling just 10 mph struck and crushed an SUV like a potato chip bag, derailed the train, and sent 7 people, including the train operator, to the hospital. 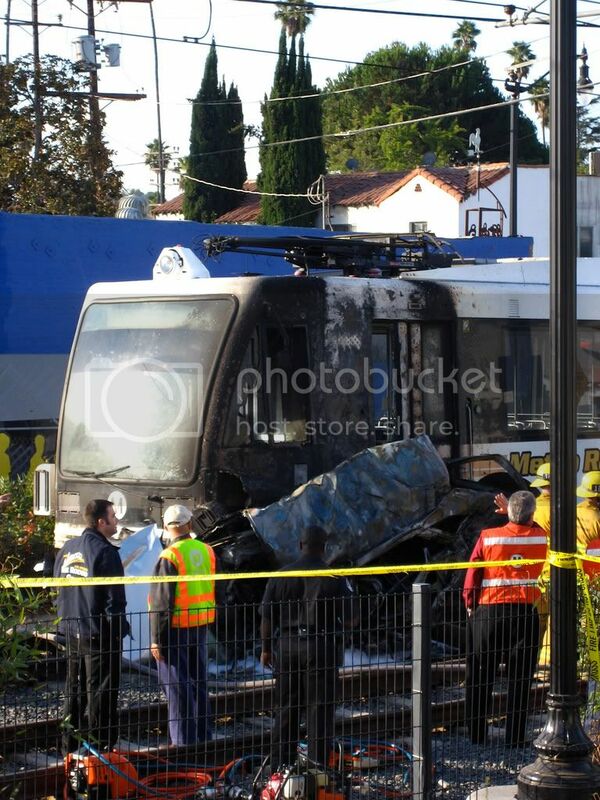 All of the Pasadena Gold Line accidents pictured/YouTubed are of accidents where the train was operating between 10-20 mph. "Two people were killed Thursday night when their car collided with a Blue Line commuter train in Long Beach, authorities said. [....] Authorities said the train had slowed to 10 m.p.h. in preparation for a stop at the Transit Mall Station, near the southern terminus of the commuter line. The impact crushed the car against the station platform, RTD officials said. MTA/Expo Spin: The Blue Line was built almost 20 years ago and technology has advanced substantially since then. THE FACTS: The age of the Blue Line is a red herring, intended to distract the public from the actual reasons the Blue Line is the deadliest light rail line in the country, which were identified in MTA's own 1998 document, in the section titled, "What Makes the Metro Blue Different from Other Light Rail Systems?" There is absolutely no mention of system age among the factors listed in the 1998 MTA report. The causes determined are all behavioral or environmental and have to do with the operation of the line. The conditions on the Blue Line are replicated or worse on the Expo Line. If age and lack of "technology" are the primary reasons a rail line is more deadly, then one would expect other systems, which are much older and have FEWER safety mitigation measures to have more deaths and accidents, correct? But the stats show that this is NOT the case. 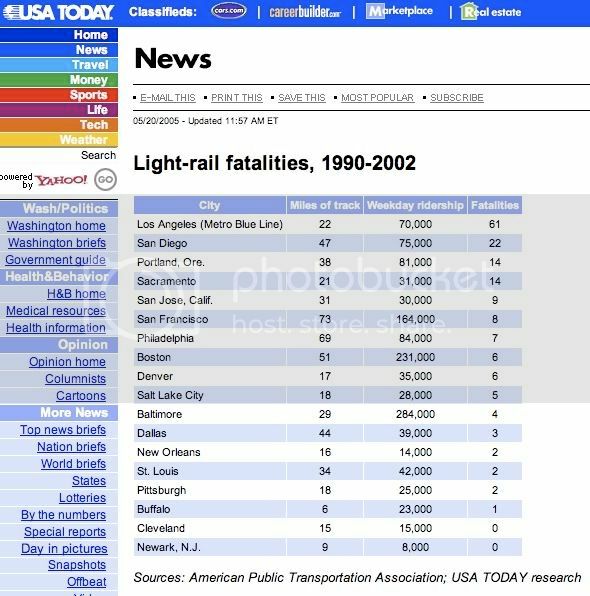 In 2002, USA Today surveyed the American Public Transportation Association statistics on light rail deaths from the Blue Line’s inception date in 1990 to 2002 and found that in all categories the Blue Line was by far the deadliest light rail system in America. Almost all of the systems are OLDER than the Blue Line and have fewer or similar safety mitigation measures as the Blue Line, yet they all have a fraction the number of deaths as the Blue Line. The fundamental difference is that in major American cities like New York City, Chicago and Washington, D.C. lengthy urban rail systems with frequently running trains intended to carry nearly 100,000 people a day are built primarily grade separated (no street crossings and primarily underground or elevated) in the urban core. MTA/Expo Spin: The Blue Line has 104 crossings, while the Expo Line has only 38 crossings, including 11 grade separated crossings where the trains are separated from vehicles and pedestrians. THE FACTS: Expo has 57 crossings, including 19 that it shares with the Blue Line from 12th/Flower to Washington/Flower. Indeed, the Flower St section of the Blue Line is the most accident-prone section of light rail in the country. In that 0.6-mile portion 154 accidents were recorded in 18 years - an average of 9 per year in just a little over 1/2-mile. It's a testament to MTA's callous disregard for safety that, not only have they neglected the problems in this portion, they now propose DOUBLING the number of trains in the most accident-prone section of light rail in the country! And what exactly is MTA/Expo's point in comparing the number of crossings? Are they insinuating that we'll only have half the number of deaths on the Expo Line as the Blue Line? That the Expo Line will only be the SECOND deadliest light rail line in the country? That instead of 500 deaths and 4500 accidents in the 100-year life of the project (the current pace of the Blue Line), Expo will just have 250 deaths and 2250 accidents? MTA/Expo's line of reasoning can only be defined as legally insane. MTA/Expo Spin: Further, Expo Line has quad gates which go across the entire intersection and make it impossible for cars to drive around the gates and beat the train. The Blue Line does not have quad gates at all gated crossings. Both the Gold Line to Pasadena and Expo lines feature quad gates, pedestrian gates and swing gates at the gated crossings in addition to the horns and warning bells. When the train is in semi-exclusive right-of-way, it can run at speeds up to 55 mph provided the right-of-way is fenced and the at-grade crossings are protected by gates. These quad gates have been successfully implemented on the Gold Line and prohibit drivers from driving around the gates. "The laudatory endorsement of safety provided by gates, even the new 4-quadrant gates, do not satisfy us for all circumstances. If gates were the definitive solution to crossing protection there would never be instances where drivers crash through them on their way to an accident." The Judge would prove to be right. Defining sad irony, on the first day of the Expo Line evidentiary hearing on the MTA/Expo's proposed crossings next to Dorsey and Foshay there was an accident at the Del Mar crossing that left an elderly motorist injured. It's a miracle that the driver of the vehicle survived. 2) Nearly all of the light rail systems that are less deadly and accident-prone than the Blue Line don’t have 4-quad gates. 3) Nearly 90% of the Expo Line street-level crossings (40 out of 46) don't even have basic crossing gates, including the major intersections of Washington/Flower, Adams/Flower, Jefferson/Flower, Vermont/Exposition, Normandie/Exposition, Western/Exposition and Crenshaw/Exposition, and several other intersections that are on children’s major routes to school. The 6 intersections of the 46 street-level crossings that do have 4-quad gates have their own sets of problems. 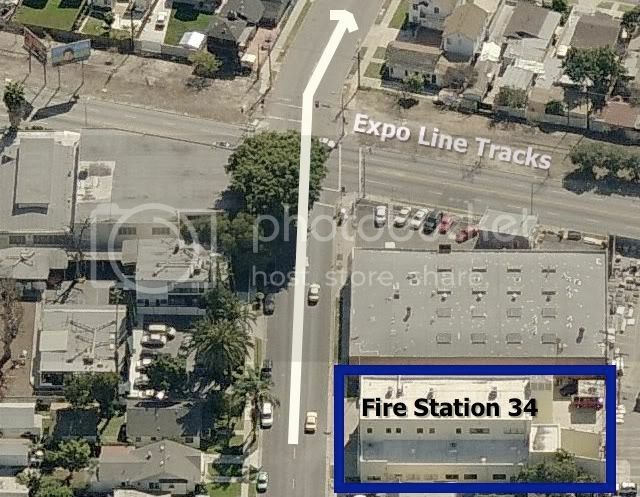 For example, Fire Station 34 is 150 feet from the 7th Ave/Exposition crossing, which uses the intersection to serve the Leimert Park community to the south (see image to the left). Crossing gates at 7th Ave intersection and others (notably Arlington/Exposition) will restrict access 40% of the time during rush hour. Any plan that impedes emergency service access is by definition unsafe. "The increased truck traffic results in increased driver frustration due to slower street traffic speeds. This frustration may result in increased crossing gate running and illegal left turns." Traffic congestion is just as bad in most locations, and worse in others around the Expo Line. MTA/Expo Spin: The Expo Line will be a state of the art rail line employing the latest technology. Safety features include LED train approaching lights, photo enforcement at signal controlled crossings, left turn pockets and left turn arrows at all at-grade crossings where left turns are permitted as well as signage, striping, enhanced crosswalks, and pedestrian countdown timers. THE FACTS: MTA/Expo is like a used-car salesman pitching a Ford Pinto by promoting the "state of the art" electric windows and wind-shield wipers. Signs, flashing lights, and fences are "state of the art?" Is this a project being built in 2008 or 1908? Only in 1950, would left-turn pockets and left turn arrows be considered "state of the art." At-grade rail was the primary mode of public transportation in the late 1800s and early 1900s and it was abandoned when traffic and personal automobiles were introduced. Most major cities replaced their high ridership trolley lines with elevated lines and subway lines, not 225-ton street-level rail lines traveling at 35 and 55 mph. The Brooklyn Dodgers got their name from the vast number of trolley lines that used to track through Brooklyn causing residents to constantly dodge trains. Sadly, MTA/Expo’s street-level light rail agenda promises to bring new relevance to the Dodger moniker in L.A.
MTA/Expo are taking us "back to the future." MTA/Expo Spin: Both lines also feature LED Train Approaching signs as well as striping and signage. THE FACTS: The Blue Line has LED Train Approaching signs, striping and signage too, yet accidents and deaths still frequently occur. Signage isn’t the main reason trains hit cars and people. Indeed, too much signage leads to driver/pedestrian confusion. MTA/Expo Spin: The Expo Line also has photo enforcement at all signal controlled crossings. b. The most recent of several Virginia Department of Transportation/Federal Highway Administration studies of photo red light enforcement in large Virginia counties, concluded that the RLCs lead to an increase in the number of accidents, specifically an increase in total crashes at intersections, increase in rear-end accidents, and increase in the frequency of injury crashes. The fundamental question is why is the “safety” being provided by MTA/Expo for South LA consist of signs, flashing lights, cameras and stripping, while the safety being provided by MTA/Expo for Culver City consist of 100% grade separation? David Solow, the Executive Director of Metrolink said, "Every at-grade crossing is an accident waiting to happen." We at Fix Expo agree. Sentinel Question: With the recent Metrolink tragedy, many residents are concerned about trains sharing tracks. Will the Expo Line share tracks with freight trains or will it have its own dedicated track? MTA/Expo Spin: The Expo Line will have its own dedicated track and will not share any track with freight trains. 1) The root cause of the horrific Chatsworth accident is a flawed cost-benefit safety analysis by our region's politicians and transportation agencies that led to a failure to invest in two separate grades for two separate rail modes (freight and commuter rail). The same fundamental/systemic problem, a flawed cost-benefit safety analysis that has tragic repercussions, has led to the current unsafe Expo Line design. Additionally, like Metrolink’s shared tracks with freight trains, at Expo Line street-level crossings the high-speed, frequently running Expo Line trains will share the same grade with cars and pedestrians. “Grade separated” is when cars/pedestrians cross on a separated level from train tracks. Just as the Chatsworth tragedy would have never occurred if freight tracks were separated from Metrolink tracks, Expo Line accidents and deaths would not occur if the Expo Line were grade separated from cars/pedestrians. 2) The Expo Line does share tracks with the Blue Line, in ironically in the most accident-prone section of light rail the country (between 12th St/Flower and Washington/Flower), as referenced above. Additionally, many of the light rail systems listed on the USA Today chart above that have killed a fraction of the number of people run near freight railroads as well. Again, MTA/Expo refuses to address the results of their own 1998 study. Sentinel Question: What safety measures are you planning to have at the Farmdale Avenue crossing near Dorsey High School? MTA/Expo Spin: The current proposal, based on the certified environmental documents for the project approved by the Metro Board in 2005, is for the Farmdale crossing to be at-grade. The intersection is currently controlled only with a stop sign. Improvements for the intersection include signalization along with vehicle gates, pedestrian gates, LED train approaching lights and a pedestrian plaza for students to wait. "If the proposed crossings at Western Ave. and Farmdale Avenue do not qualify for grade separation from a safety perspective, then no crossings would." "All of these gates, however, can be avoided easily by pedestrians. Considering the large number of crossings during peak periods, and the student populations using the crossing, we find that any system of gates or other warning devices at-grade would not eliminate all potential safety hazards." MTA/Expo Spin: Furthermore, Metro has offered to slow down the train to 10 mph in the hour when school starts and the hour in the afternoon when school lets out to ensure that students follow the rules. "MTA will be the operator of the line, and Expo Authority did not offer any additional testimony, or support from MTA, regarding the slowing of trains at Farmdale Ave."
MTA/Expo has only said they would be willing to slow down the trains in their desperate attempt to get approval for their unsafe street-level crossing. They first said they'd slow it down to 35, then 25, then 10. "[A]nother Del Mar and Ave 45 and Ave 50 situation. Until someone else comes along and wants to speed it up!" The email is to the left. MTA received approval by the CPUC to operate trains across Del Mar, Ave 45 and Ave 50 on the condition that the trains would operate at restricted speeds. Months later, the MTA petitioned/pressured the CPUC to increase the speed limits of the crossings. Accidents have occurred at each of the crossings, including just a couple of months after Mr. Khawani's email at the Del Mar crossing. 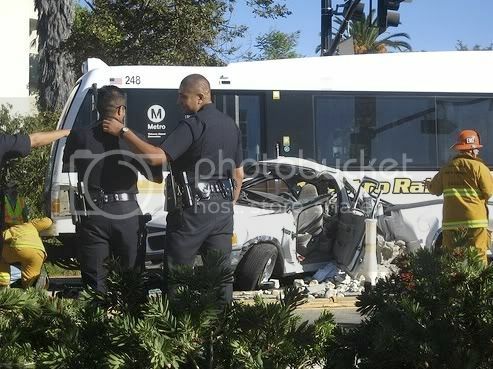 (Pictures and video footage of the Del Mar and Ave 50 accidents are in this post). The allowable limit, and the limit requested by MTA/Expo in their CPUC application for Farmdale is 55 mph, just a stones throw from Dorsey HS. Maj. Quimby’s Answer: And what happens is if you slow the trains down, your window of hazard lengthens. And then you get the condition, the population to believe, well, the train is slow. It’s hard to judge a train coming head on at you with a headlight on. And that basically causes the students, emboldens them to basically say, well, the train is only going ten miles an hour, I can beat it, and run across the tracks in front of the trains. I guess in [National Transportation] Safety Board studies that we’ve done you end up creating as many problems as you solve by slowing the train down. You just create a longer window of opportunity or hazard. Expo’s Question: And your statement that the students would be embolden to run across the tracks, what do you base that on? Maj. Quimby’s Answer: Well, they’re going very slow, and you got students who are impatient and standing there waiting for a slower train to go by, and they feel like they have more time to beat the train across the tracks. MTA/Expo Spin: Further, Metro has offered to post Sheriff’s deputies at the crossing during these same time periods to ensure student safety. If a handful of Sheriff’s deputies can control 700 urban high school teenagers stampeding across the Farmdale intersection at rates up to 108 per minute they shouldn’t be working for the LA County Sheriff they should be serving in the Marines in the Baghdad Triangle. And again, there was not then and there is not now any written agreement proposed. MTA/Expo Spin: These safety features replicate similar safety features employed by the Pasadena Gold Line near Blair High School, which has a light rail crossing at-grade right near that school. Blair High School is near the Pasadena Gold Line but the students must cross the tracks to get to the bus drop off and pick up area. As a result, hundreds of students must cross the tracks each day. "The parties discussed several other crossings at or near school sites along other light-rail lines. However, none of these cases presented the unique characteristics of the proposed Farmdale crossing at Dorsey." Blair HS is nothing like Dorsey HS. To begin with the closest opening to Blair High School is 2 blocks, two traffic signals and 900 feet away from the closest Gold Line crossing, while the Expo Line literally abuts the Dorsey HS campus. Sentinel Question: What safety provisions will the Expo Authority put in place to protect students near the Foshay Learning Center crossing? MTA/Expo Spin: There is a current underground pedestrian crossing at the Foshay learning center which is operated by LAUSD. THE FACTS: MTA/Expo's assumption that the Harvard pedestrian tunnel can or should remain open all hours of the day, displays their level of insensitivity to our community, and true lack of concern for our general welfare. "The tunnel also presents other access and security issues. Left open and without supervision, the tunnel provides a convenient location for crime (theft, robbery, assault, etc. ), and also presents other problems related to sanitation and public health. Because of these safety and security issues, the tunnel currently is open only during the approximate 30 minute period before and after school hours; and, operation of the tunnel is supervised by adult volunteers (mostly parents and others associated with Foshay)." The remainder of the public and students arriving/departing the campus all other times of the day (i.e. for after-school activities and to use the health clinic on campus) would either have to hop the MTA/Expo fence or cross at Western or Denker. MTA/Expo has closed the other three crossings between Western and Denker: Harvard St, La Salle and Hobart Blvd. Western and Denker are the bigger issue. Even before MTA/Expo divided the community by putting up barriers for the 1/3rd-mile between Denker and Western, the large majority of Foshay students crossed at Denker and Western. 400 students use the tunnel after school, while over 1100 use Western and over 300 use Denker. MTA/Expo Spin: There will also be a fence so that students cannot cross the street illegally in this area. THE FACTS: A fence to a middle-schooler is an invitation to climb. In meetings with MTA/Expo the Foshay administrators told them of students scaling the 20-foot fence on the edge of the campus, yet MTA/Expo has proposed a fence that is less than 4 feet tall in some places (the law limits fence heights near intersections for visibility reasons). "'Every day we fear that something like this could happen,' said Mabel Cail, who lives in the victim’s apartment complex next to the rail corridor near Long Beach Avenue. The neighborhood has large numbers of children, she said, who constantly crisscross the freight and passenger tracks." MTA/Expo Spin: There will also be at-grade crossings at Western and Denker, where the train will be traveling with the traffic signals at the posted speed limit not-to-exceed 35 mph, and students can cross with pedestrian countdown timers and signals. "A young woman was fatally run over by a Blue Line train on the south side of downtown Saturday, a fire official said. "Paramedics were sent to the 1800 block of South San Pedro Street at 12:28 p.m., said Los Angeles city fire spokesperson d'Lisa Davies. "The Long Beach-bound light-rail train was unable to stop before striking 20-year-old Maxmiliana Gomez. The Blue Line driver stated that a group of three -- two males and Gomez -- attempted to run across the tracks in front of the train. The young woman was unsuccessful in her attempt and she was declared dead at the scene. "'Maxi Force Airbags' were used to extricate the body from underneath the train, which took an hour. "The accident delayed service on the downtown-to-Long-Beach line." These are just some of the youth/youngsters pedestrian deaths and injuries we’ve been able to identify in a similar street-running section on the Blue Line from media reports over the past few years. How many more are there that MTA/Expo won't tell us about, and how many can we expect over the 100 years of the Expo Line? MTA/Expo Spin: During the environmental planning phase of the project, it was determined that a grade separation was necessary at Figueroa and Flower based on traffic levels at these crossings. THE FACTS: MTA's original 2001 Expo Line plan was equally bad around Exposition Park and in Culver City as it is currently in South LA. There was an at-grade crossing at Figueroa/Exposition by USC. There were at-grade crossings at Jefferson/National and Washington/National in Culver City. Even as late as the summer of 2005, the Culver City crossings were all designed to be at street-level. All of those intersections were subsequently changed - grade separations were added. No grade separations were added to the section in South LA between Farmdale and Vermont. MTA/Expo Spin: The complex geometry of the 110 Freeway offramps in that area makes it difficult to build an aerial grade separation. This segment of the alignment would extend from approximately 29th Street, on the east side of Flower Street to Exposition Boulevard to approximately Vermont Avenue. The majority of this profile would be at-grade with an elevated segment between approximately Jefferson Boulevard to approximately 1,000 feet east of Menlo Avenue. The major drawback of the aerial option is the aesthetic division that would have been created with the ramp down on Exposition Blvd between USC and the Rose Garden from the elevated structure, known as the "retained fill." See the diagram from the 1992 Environmental Impact Report to the right. It's not hard to understand why a concrete wall dividing the Exposition Park Rose Garden and USC campus was not welcomed and the undercrossing option was preferred. MTA/Expo Spin: As a result, the grade separation will be in a shallow trench which will extend from south of Jefferson Blvd., will go under Figueroa and Flower and will surface at Trousdale Ave, which is in front of USC. 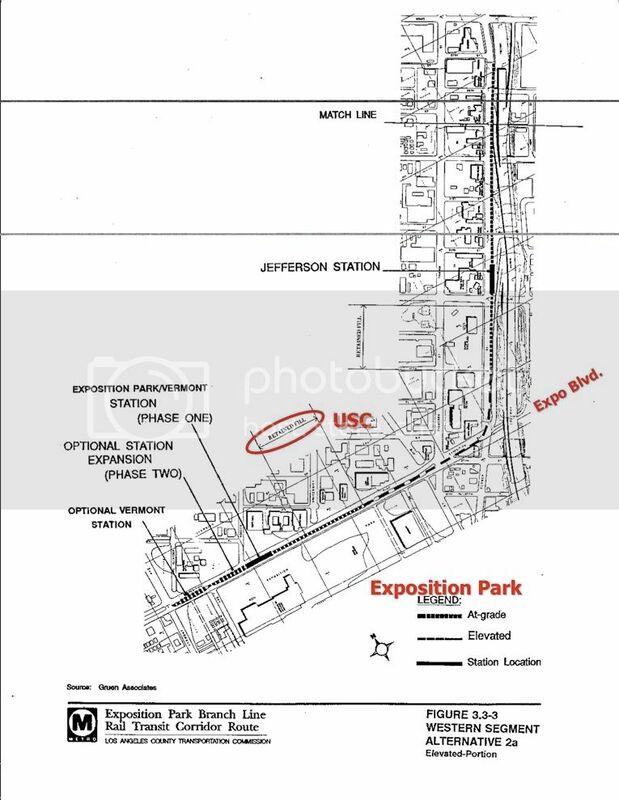 THE FACTS: Exposition Blvd is the back of USC, not the front. And, other than game days, the Trousdale crossing has very low pedestrian traffic. Figueroa is the location where the bulk of the USC pedestrian traffic crosses Exposition today and will in the future. At Figueroa the Expo Line will be underground. MTA/Expo Spin: USC had requested that the trench continue all the way to Vermont instead of surfacing at Trousdale. USC was told that the trench could continue to Vermont only if USC paid the cost differential of $120 million. "The cost-benefit analysis presented by Expo appears to be self serving at best with those limited alternatives that were presented lacking any in-depth, unbiased comparison. Costs of alternatives also appeared to be inflated with no supporting documentation in an effort to support Expo's predetermined design." THE FACTS: More so than any other statement, MTA/Expo's assertion that the safety and preservation of a community should be predicated on the community’s ability to pay for it illustrates why the agency is constantly engaging in environmental racism. The process by very definition leads to projects that are built better in more affluent communities than in poorer/minority communities. South LA residents and businesses pay taxes too! More to the point however, Fix Expo is as concerned about the at-grade portion from Trousdale to Vermont as we are in other areas. We fought equally hard before the CPUC to keep that section underground as we did west of Vermont to La Brea. We've highlighted the smoking memo by Gloria Jeff, the former head of LA's Department of Transportation, that states the at-grade design between USC and Exposition Park is "not safe for pedestrians" and will lead to major gridlock, along with the CPUC staff request to extend the trench to Vermont. Incidentally, the day that memo was publicly delivered to the MTA Board meeting, Gloria Jeff was fired for undisclosed reasons. The Fix Expo proposal is to extend the trench to Vermont and establish Vermont as the temporary terminus, while the environmental work is approved to redesign the portion from Vermont to La Brea. Furthermore, after we spoke with several national environmental justice experts we were informed that the USC community is technically an environmental justice community as well, when considering the economic demographics of the census tract, given that students are technically poor. 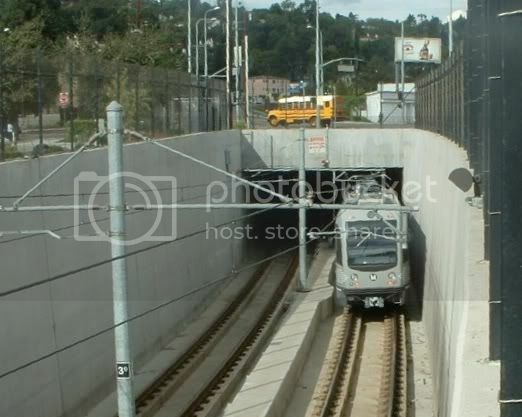 Sentinel Question: Why does the Expo Line only go underground near USC and not for the entirety of the project? MTA/Expo Spin: Light rail projects typically operate at grade. "It was not until the 1970s that the term "light rail transit" came into use in the United States. There was no formal definition of LRT at the time, but it was generally understood to mean an urban rail transit form that was leaner and less costly than other rail modes. "LRT is designed to accommodate a variety of environments, including streets, freeway medians, railroad rights-of-way (operating or abandoned), pedestrian malls, underground or aerial structures, and even in the beds of drained canals. It is this characteristic that most clearly distinguishes it from other rail modes." In fact, even MTA's own light rail Green Line, is 100% grade separated. 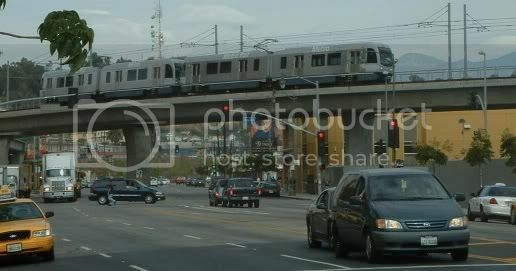 After the train turns off the 105 freeway in El Segundo it travels on primarily elevated tracks for nearly 4 miles. Incidentally, 4 miles is the same distance Fix Expo request the Figueroa trench be extended through South L.A. The number of autos hit by MTA’s 100% grade separated Green Line since it opened in 1995 thru 2008: ZERO. The number of autos hit by MTA’s at-grade Blue Line since 1995 thru 2008: Over 445. MTA/Expo Spin: There are other at-grade light rail projects in Los Angeles County such as the Gold Line to Pasadena and all over the country, including Portland and Phoenix. THE FACTS: Los Angeles is in a class of cities that includes New York City, Chicago and London, not Portland (which is about the size of Long Beach), Phoenix, San Diego, or most of the other cities MTA/Expo cite as light rail cities. The backbone of the public transportation system in similar world-cities like New York, Chicago and London is a grade separated rail system - not street-level rail. And in Los Angeles, we have unique traffic nightmares due to our poly-nuclear region. We agree with the Asst. General Manager of LADOT, John Fisher who said, "[A]ll rail should be grade separated." With the worst traffic in the country, how are at-grade (street-level) crossings of major streets even being seriously considered? The Expo Line is a 100-year project. Simply comparing how much worse traffic is today, compared to 20 years ago, illustrates to any clear thinking person how and why street-level crossings that will worsen traffic for the next 100 years make no sense. MTA/Expo Spin: In 2003 Metro adopted a grade crossing policy which developed objective criteria for determining when a crossing should be at-grade or grade separated. The criteria takes into account traffic, safety, engineering concerns and other issues. THE FACTS: If the MTA's grade crossing policy were applied to the Blue Line, the deadliest light rail line in the country, street-level crossings that collectively have been involved in hundreds of accidents and countless deaths would have still been built at street-level. Indeed, applying MTA's grade crossing policy to the Blue Line would have required some of the few grade separated crossings on the Blue Line to have been built at street-level! This is what MTA/Expo call their "safety policy"?! "Metro’s Grade Crossing Policy is not a safety-based policy. In fact, as far as I can tell from [Expo Construction Authority CEO] Mr. [Rick] Thorpe’s testimony, the policy has nothing whatsoever to do with safety and is concerned almost entirely with Metro’s operational convenience regardless of safety concerns. "The policy cannot seriously be described as a safety policy because traffic volume and train frequency alone tell you very little about the safety of a rail crossing, particularly when traffic volume is reported on a per lane basis. As far as Metro’s Grade Crossing Policy is concerned, for purposes of grade classification, a crossing that intersects a single lane street going in one direction with no pedestrian traffic is analyzed identically to a crossing that intersects twelve lanes going in six directions with peak pedestrian traffic in the thousands per hour. As long as train headways and per lane traffic volumes fall within acceptable standards, a crossing will be designed at-grade with no need for further review or analysis. "The Metro Grade Crossing Policy is a logical operational policy from a rail perspective, but it does not nor should not replace a responsible, comprehensive system safety analysis, which should include a human performance study. The risky designs of these two proposed crossings illustrates the point that factors beyond train frequency and vehicle traffic must be taken into consideration to create designs that are reasonably safe for the public – and particularly for children. If the proposed crossings at Western Ave. and Farmdale Avenue do not qualify for grade separation from a safety perspective, then no crossings would." MTA/Expo Spin: This grade crossing policy was applied to the Expo Line, and a grade separation at La Brea was added to the project, in compliance with the grade crossing policy. There are also grade separations at La Cienega, Flower/Figueroa and Venice/Robertson, all of which met the criteria of the grade crossing policy adopted by Metro. THE FACTS: It's very telling that MTA/Expo fails to mention the crossings in Culver City that are grade separated, but did not "meet the criteria of the grade crossing policy": Jefferson/National and Washington/National intersections. The point is, even MTA's flawed grade crossing policy is not objectively applied. "The original [preferred Expo Line plan] adopted by the [MTA] in 2001 called for at-grade rail crossings at all intersections in the City of Culver City and an at-grade station at Venice/Robertson...This configuration conflicted with the adopted [Culver City] General Plan that called for no at-grade crossings and full grade-separation of all crossings in that city. Primarily for this reason, the City of Culver City opposed the project...in 2001." As a result of those grade separations, west of La Cienega to the Culver City terminus of Phase 1: no child will ever have to walk across the tracks, no car will ever have to drive across the tracks, no train horn will ever be blown, traffic won't be worsened with crossing gates or street closures, and there is no privacy impact on the directly adjacent residential community. The City Council of Culver City is to be commended for hearing its residents and standing up to MTA. But when MTA/Expo decided to spend the money for 100% grade separation in Culver City (the only residential area that is middle-to-upper-income and majority Caucasian), and not in the majority-minority and/or poor residential communities it contributed to MTA's violation of environmental justice laws. MTA/Expo Spin: The light rail trains are electric and so the trains themselves create very little noise. Even when MTA’s Pasadena Gold Line trains are slowed down to nearly half the speed that the Expo Line will be traveling and/or use the “quieter horn,” the trains still emit noise in the 85-92 decibels range, which is above the level that noise can cause hearing damage. And on the Blue Line, sound readings have been recorded up to 97 decibels, which puts the train in a noise category with jackhammers! MTA/Expo Spin: The California Public Utilities Commission (CPUC) requires bells to sound when a train approaches and crosses an at-grade crossing protected by gates. The CPUC also requires the train to sound a horn prior to entering the crossing. The Expo Authority has proposed stopping the warning bells once the gates are down and will apply to the CPUC to implement some of the measures successfully implemented by the Pasadena Gold Line, including the use of a quieter quacker horn on the trains in non-emergency situations and installing shrouds on the warning bells to focus the noise at the crossing. Attorneys said Tuesday they will represent Gold Line neighbors who complain their quality of life and property values have been eroded because of the train's noise, speed and vibrations. A civil lawsuit alleging inverse condemnation - something that hurts property values - is expected to be filed in the next few weeks. The defendants would be the Metropolitan Transportation Authority, which operates the light rail, the Blue Line Construction Authority, which planned it, and the contractors hired to build the Gold Line, said Wayne Kreger, an attorney with the Santa Monica law firm of Verboon, Milstein & Peter. “The issue is how loud is it supposed to be, and how loud is it,” Kreger added. She lives in a modest apartment along the Gold Line. A chicken-wire fence separates her building from the tracks. Brockman says the whooshing and screeching sounds from the light rail keep her up all night. She has to swallow a sleeping pill to sneak a little shut-eye. Vibrations coming through the walls of her apartment, she says, have been tearing up the grout in the kitchen floor. "This is terrible - it sounds like a tremor coming through," she says. "I haven't slept in years." Only two of the apartments in her complex are rented out. The other tenants left after the Gold Line started running, and few renters have taken their place. "As has been previously explained, MTA and the Construction Authority have been engaged in defending against multiple claims of inverse condemnation involving fifty-plus homeowners in South Pasadena who have alleged in suits filed in Superior Court that the design, construction and operation of the Gold Line have created noise and vibration to an extent that either has physically damaged their properties or has diminished the value of their properties. In addition, at least one property owner has asserted that the mere existence of the pre-existing Gold Line has caused them to spend additional sums to incorporate increased structural elements to reduce the impact from noise and vibration. Although those experts may have conducted tests involving noise and vibration, the results of any such tests are trial materials and are not something MTA is willing to disclose outside of the confines of the litigation, as trial is to begin in early December." "Locked into what now is a mature, 10-year-old system that defies a massive overhaul, the MTA struggles to bring down Blue Line casualties with rigorous training of operators like Walden, aggressive law enforcement, and constant tinkering with fences, horn sounds, signal lights, traffic gates and other safety hardware. "Swing gates, which pedestrians have to pull back, rather than push forward, have been installed at some stations. The sound of the horn has been changed." When a train begins hitting and killing people, oversight agencies typically require the transportation agency to implement cheap safety upgrades, because after the train is operational, MTA considers grade separation cost-prohibitive. Increasing the sound of the alert system (i.e., increasing the volume of the horn) is a cheap safety upgrade, which is why the Blue Line horn has become louder. 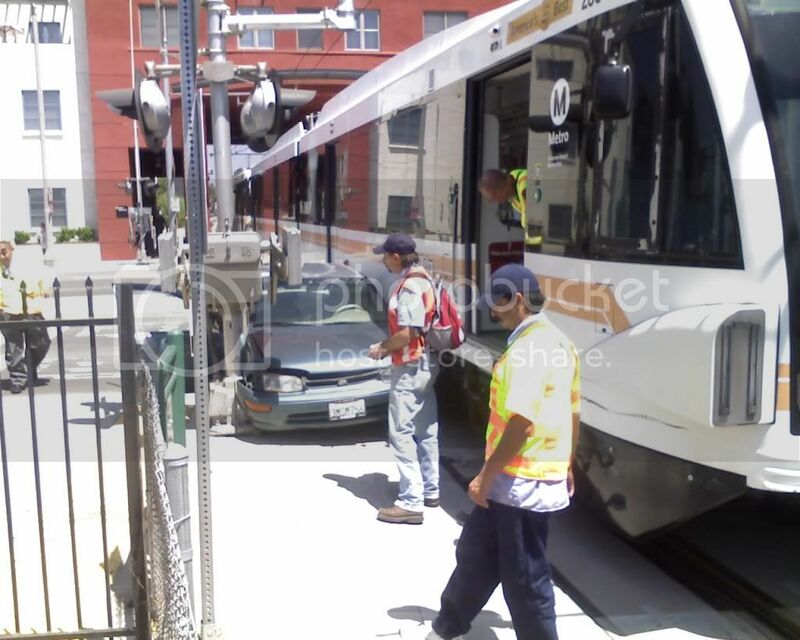 The same can be expected to occur on the Expo Line if built at street-level. MTA/Expo Spin: The environmental document also identified areas along the alignment where noise will need to be mitigated. These mitigation measures include soundwalls, which are being built in the areas identified in the environmental document, such as residential areas. 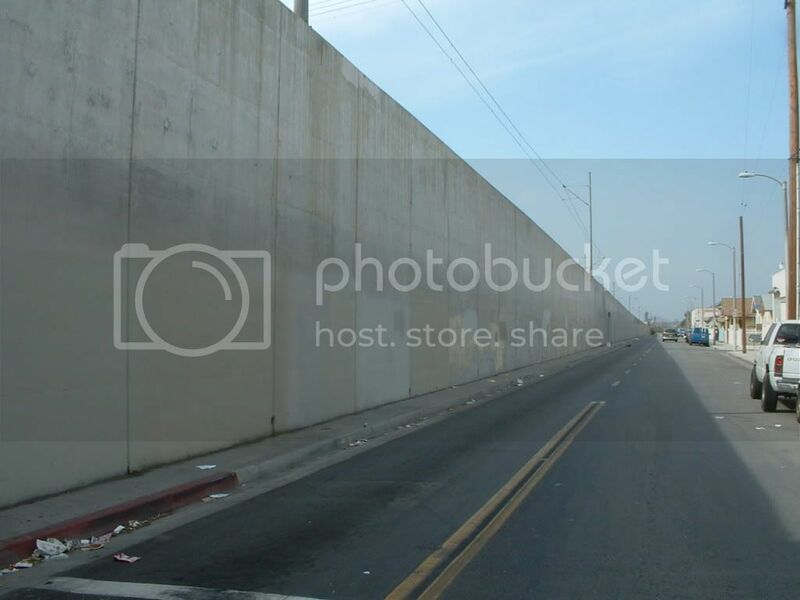 THE FACTS: There are hundreds of homes, schools and places of worship along the Expo Line between Vermont and Clyde (one block east of La Cienega) where sound walls will not be implemented. There are no sound walls between Vermont and Gramercy Place, and no sound walls on the northside of the tracks between Gramercy Place and La Cienega. These locations were omitted from the MTA's sound wall list because the need for sound walls is predicated on a project's ASSUMED noise impacts. (If the assumptions are faulty, then sound walls are not required.) Regarding the validity of these sound wall assumptions, MTA's noise impact study came to the conclusion that at Dorsey H.S., just 30 feet from classrooms, a sound wall wasn't needed, despite the assumption that the train would be traveling by at 55 mph and blowing its horn. The Farmdale crossing at Dorsey in many respects is the posterchild for the project's deficiencies. Additionally, sound walls don't extend across intersections, so even with the best sound walls, communities directly adjacent to crossings will still be adversely impacted. In every single light rail project built by MTA and predecessor agencies (the Blue Line, Green Line and Gold Line), the agency has drastically underestimated the project's adverse environmental impacts, specifically the noise impacts. (More on this in a follow-up post). MTA/Expo Spin: Light rail trains are electric and so will have a beneficial impact on air quality in the community because it reduces the number of cars on the street that produce harmful emissions. "Increased traffic and vehicles idling near the school sites, as well as increased dust generated from the light rail will have an adverse effect on the health of school occupants." The closed streets will also lead to longer local travel patterns, and increased congestion on our major thoroughfares. Residents that would walk across the street to visit their neighbors/go to the corner store are now forced to drive, because of the community division MTA’s train project has created. MTA/Expo Spin: Community participation is an important part of any major capital infrastructure project and community outreach is a high priority for the Expo project. The staff has made presentations about the project at local homeowners groups, neighborhood councils, local businesses and faith based groups. "[W]hen the room was told about the previous day's accidents and the history of substations on MTA's other light rail lines catching fire, the room demanded an on the record question and answer period, only to be forcibly denied by the Expo Authority. "'We were told that if we wanted to have our comments recorded we had to go in the corner and a court reporter would write them down,' said Jackie Ryan of Save Leimert Neighborhood Coalition. 'I was completely insulted,' she continued." "Publicist Greg Starosky, Construction Manager Mark Van Gessel and designer Roland Genick made it plain they were at the Senior Center to lecture not to dialogue with strongly curious, polite and disappointed members of the audience. "The gentlemen from the Expo Construction Authority declined to answer questions, not even uncomplicated ones." These are divide and conquer tactics intended to keep the meeting participants from being adequately informed about the project’s defects, which need to be addressed. The public relations tactic is exceptional even for MTA. Expo is the only MTA project where there is never an open forum for a question and answer period after staff presentations. Why are we being singled out? Why is MTA/Expo attempting to silence our voices? Additionally, at some of these stations Expo “Community Relations” representatives have been caught on tape YELLING at community residents who are simply asking questions. MTA/Expo Spin: As part of the planning process, Metro held 11 large scale community meetings along the Expo corridor, with over 850 attendees, from May 2000 through December 2002. A listing of these meetings is contained in the environmental documents. THE FACTS: More people have attended the Fix Expo meetings in the past year than in the entire environmental review process, because of the dedicated outreach of the members of the Fix Expo Campaign. 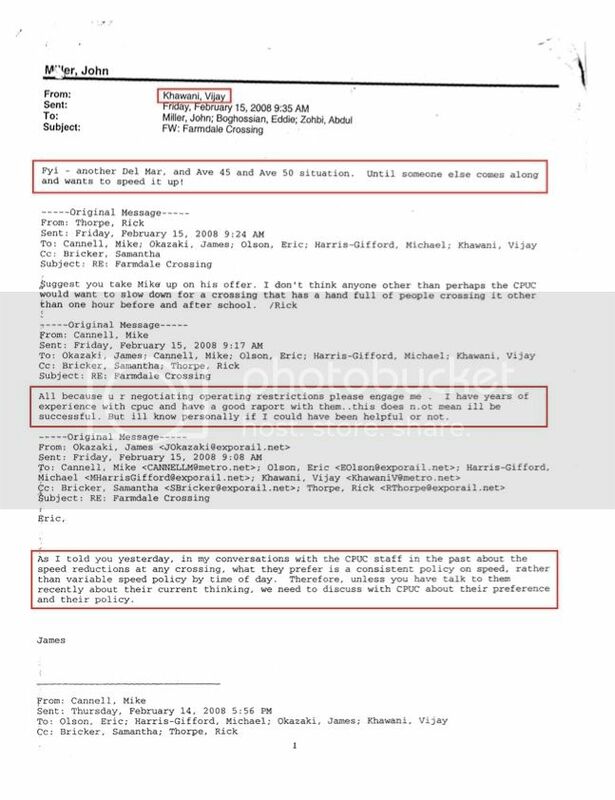 "The names of the association[s] were fictitious and could not be verified by the MTA....[T]he President of the Baldwin Hills-Crenshaw Coalition...indicated that she had never heard of these groups. It appears that [MTA] fabricated the names of neighborhood groups with which they had interacted along the Mid-Corridor"
MTA/Expo Spin: Further, working groups were formed during the planning process, which were comprised of residents, stakeholders and businesses along the corridor, who provided input into the project. THE FACTS: MTA/Expo's "working groups" have never been authorized to make or even seriously discuss major decisions, like where to add grade separations. The working groups existed to talk about the type of trees, the color of the line, the heights of the fences, etc. Furthermore, many of the working groups were flooded with people who don’t live in the South LA community whose only goal is to get the train to Santa Monica as soon as possible. Here's Fix Expo's offer to MTA: give us the same investment and safety in the 4.5 miles in South LA between Vermont and Clyde (one block east of La Cienega) as the 1 mile between La Cienega to the Robertson terminus in Culver City, and the Fix Expo Campaign will commit to planting the trees. MTA/Expo Spin: Further, the community relations team has worked with all of the schools along the alignment and has distributed safety information relative to the project as well as other construction related information. THE FACTS: MTA/Expo doesn't “work with” anyone. MTA/Expo tell people what they are going to do. For four years the Foshay Learning Center principal requested MTA/Expo come to her school to present the project to the community, parents and school, and for four years MTA/Expo refused. When they finally did show up, it was to tell them about the construction activities. "We must make it clear that LAUSD-OEHS believes that the safest solution to potential pedestrian-train conflicts at the Exposition Blvd/Farmdale Ave. intersection is to grade-separate this crossing. However, in discussion with the Expo Authority, we were informed that this approach was not feasible, and would not be considered further." MTA/Expo Spin: In other cases, there are legitimate concerns regarding construction impacts, noise, safety, and traffic issues and it is our obligation to address these concerns and mitigate them to the extent possible. THE FACTS: MTA/Expo’s smear campaign against the community leaders and public agencies that have issues with the MTA/Expo’s street-level crossings is not what most people consider addressing concerns. Sentinel Question: What are the economic benefits of the Expo Line for the community? MTA/Expo Spin: The Expo Line will provide enormous benefits to the community by providing reliable and affordable access to jobs, health care, and entertainment. THE FACTS: Building the Expo Line in a trench and/or tunnel in the South LA community, or grade separated like it will be in Culver City, will make the Expo Line an asset instead of a foe to the community. It would allow the Expo Line to operate without having to increase the safety hazards on our already dangerous streets, divide neighborhoods, and impose adverse health and traffic impacts on the South LA communities for 100 years. It would also result in a faster, more efficient and more reliable transportation mode for the region. Sentinel Question: There appears to be some community opposition to this project. What are the origins of the opposition? What is the basis for the opposition? MTA/Expo Spin: There is often concern by some residents regarding the change that the project will bring about in the community and fear of that change. THE FACTS: Einstein said, "Insanity is doing the same thing over and over again and expecting a different result." So with MTA’s horrible track record in building light rail lines, particularly through black and brown communities, what thinking person would not have concerns? Fix Expo has concerns, but we do believe they can be addressed by building the citizen's alternative of a tunnel or trench from Figueora to La Brea. It would allow MTA/Expo to build a project we all could embrace - one that would be a good neighbor to the South LA community for the next 100 years, and doesn't increase the safety risks South LA, our children, the elderly and the disabled face on a daily basis. It is condescending and characteristic of MTA/Expo to claim some people oppose their current plans due to a “fear of…change." It is MTA/Expo's deceptive tactics, disrespect of community leaders, systematic attempts to exclude open discussion of project issues, track record of failures, and overall callous disregard for safety and communities that has bred resentment, distrust, and skepticism in the South LA community, not "fear of change." Change is needed…at MTA/Expo and in the Expo Line project! On November 5, 2007, at the CPUC Public Hearing at Dorsey High School, about 500 residents, students, parents, teachers, administrators and child advocates packed the auditorium to deliver a message to CPUC Commissioner Timothy Simon and CPUC Judge Kenneth Koss about the Expo Line's proposed primarily at-grade design through South LA. Breeves Brogan, an area resident, pleads with the CPUC Commissioner, "So please, in the name of Jesus don't kill any children today. Their blood will be on whoever's hands makes the decision." Why Not In South LA? Sharon Rogers of the New Frontier Democratic Club and Los Angeles County Democratic Party Central Committee states, "Culver City children won't have to walk across tracks with 225-ton trains traveling at 55 mph coming up to 30 times per hour, why should ours?" Michelle Colbert of Save Leimert and the Empowerment Congress West Area Neighborhood Council states, "If we accept the line at it's current design South Los Angeles will literally be the other side of the tracks. There is data that shows that black and brown communities are more likely to have hazardous conditions placed in their communities. This dilemma wreaks of environmental racism, and an inferior diminished quality of life. Everything about the current design of this train is egregious and terribly wrong." Prof. Najmedin Meshkati, the creator of the USC Transportation system safety program, quotes Metrolink CEO David Solow, "Every grade crossing is an accident waiting to happen." Irwin Davidson, a local property owner reminds MTA that, "It's not acceptable. We're a rich country. We can afford better than the very minimum. What is cheap today will be expensive in the long run." A native New Yorker states, "It's incomprehensible that you would consider bringing something as important as mass transportation to Los Angeles in the 21st century and having it doing this up and down sort of thing." A local resident asks, "If the MTA Blue Line was kind of flawed why put another flawed system in?" Mark Jolles reads from an article that quotes former LACTC Commissioner regarding the Blue Line deaths, "It's not fair to blame motorists. It's a terrible cop-out to blame pedestrians or kids to say they are at fault." Mr. Jolles concludes his personal statement with, "It's not the citizens that are causing problems. It is a low standard of engineering of the crossings." Steve Bagby, president of the Dorsey HS Alumni Association: "As former Deputy of Transportation for the late Congresswoman Juanita Millender-McDonald to have overseen the Alameda Corridor as I have, I've seen the cut-and-cover - I've seen it be below grade in the communities of Compton and Lynwood, and the city of Los Angeles deserves no less. You cannot put a price on a child's life." Andrea Canty the VP of the Dorsey HS Alumni Association: "The tracks will be so close to the bungalows that are here, which will impede student learning." Jackie Conkelton a Dorsey surrogate parent and foster parent: "I raise other people's children; I don't want anything to happen to them. And the people who have their own children, they don't want anything to happen to them. We take them to school in the morning and we want to pick them up in the afternoon." Tinisha Brooks, president of the Dorsey Senior Class '08, "If a train going 25 mph can turn a Ford F-150 into a tincan, your child has no hope." Shellea Daniel of Dorsey ASB, "What if a train derails into this queuing area?" Afolabi, Dorsey student, "Once the line is operating everyone is going to get distracted." Rev. Donald Wilson of Dorsey Motivated Men: "An Expo Light Rail Line is needed, I do agree with that...but I want this committee to strongly consider how you want to bring it through here through Farmdale...at ground level. This is a very dangerous situation." Harold Washington of the Sutro Block Club: "It's not safe. I'm a former alumni of Dorsey High, class of '61. I would [have been] the first one to jump that fence and end up being hit by the train." Thabiti Ambata: "There is no way you can build a gate high enough. Testosterone rules these children." North Area Neighborhood Development Council Mike Ureña, president of the North Area Neighborhood Development Council: "I understand the logic of the design, but I think in practice it simply is not going to work. I also want to point out to you that when I was a kid as when you were a kid, we thought we were going to live forever." Treat Us Right Nelle Ivory, a passionate veteran Leimert Park activists responds to MTA's proposed holding pen at Dorsey HS, "I asked the manager of Expo - he said they were going to build a holding pen at Dorsey to keep the kids in. That's insulting! I know what a holding pen is, we used to put our cattle in there before we sent them to slaughter. Is that the same thing they're going to do to our kids?" West Adams Neighborhood Council Hattie Babb of the West Adams Neighborhood Council, which covers the area around Dorsey delivers the neighborhood council's findings and concludes: "Be it resolved that the West Adams Neighborhood Council supports beginning to build the Expo Line below grade from USC trench through South Central Los Angeles as far as the existing $640 million budget will allow." Marta Zaragosa of the East Culver City Neighborhood Alliance begins with, "This is not about moving people out of their cars, [off] of the freeways. It's about developers who have been buying property along the line for the last 15 years. And these same developers have given money to our politicians who have run for office." Julia Ansley, "Our elected representatives in this community, laid down, took a walk, because they want money paid to their campaigns." Tut Hayes, "You got to recognize that MTA and Expo they don't build transit. This is million dollars worth of construction there's big money in this." Jackie Ryan of Save Leimert and Leimert Park Business Association states, "You - the community - you here tonight are going to determine how this railroad is going to come."